Dude. Dude, Bro. Call Chet and the other pledges, tell them to stop cleaning the kegerator Ox threw up into. Tonight's rager is back on. We'll keep the ponies cold with these giant coozies, what are they called? 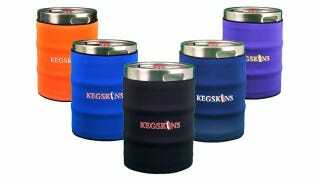 KegSkins? Righteous. The KegSkin is constructed from neoprene and operates in precisely the same manner as its bottle-and-can-covering brethren, simply sliding over a standard-sized keg of your preferred man soda. Despite its basic construction—take a sheet of neoprene, roll it into a cylinder, and sew—it does an impressive job of keeping beer at the optimal consumption temperature. In a lab test, two 38-degree kegs were subjected to an 80-degree environment for over five hours. The insulated keg only warmed six degrees over that period (44 degrees F is still plenty frosty) while the unprotected keg heated nearly 20 degrees in total to a flattening 57 F.